Can someone teach Ariana Grande how to wear hats? 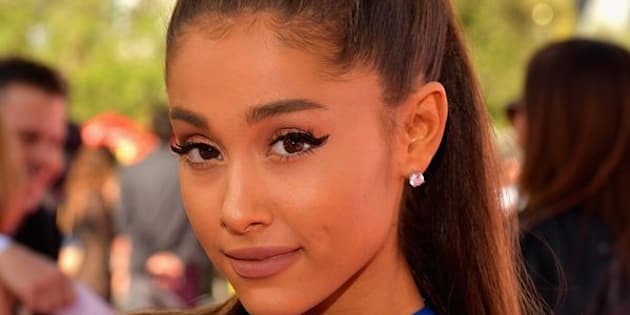 Never doubt Ariana Grande’s commitment to her high pony. The singer’s sky-high ponytail has become her signature hairstyle. After dying her hair red for years on Nickelodeon shows Victorious and Sam & Cat, Grande’s tresses were so damaged that she took to taming her hair into the ponytail we all know and love. But Grande may have finally taken the high pony too far. In a photo uncovered by intrepid Twitter users, Grande sports her usual hairstyle and a baseball cap. Look closely and you’ll see that Ariana has literally cut a hole in her hat to accommodate her ponytail. You have to admire the singer’s dedication. Lowering her ponytail or letting her hair down is too easy for Grande. She’d much rather hack a hole through the top of her baseball cap. Naturally, Twitter had a field day. @ArianaGrande@ArianaGrande Can we talk about you cutting a hole in your hat for your ponytail. LMFAO I love you. Ariana Grande having a hole in her hat for her ponytail is better than any song she's ever released. Give Grande a pair of scissors, and she’s a dangerous woman indeed. Might we suggest a visor next time? Correction: A previous version of this story incorrectly identified the channel for shows "Victorious" and "Sam & Cat." They aired on Nickelodeon.